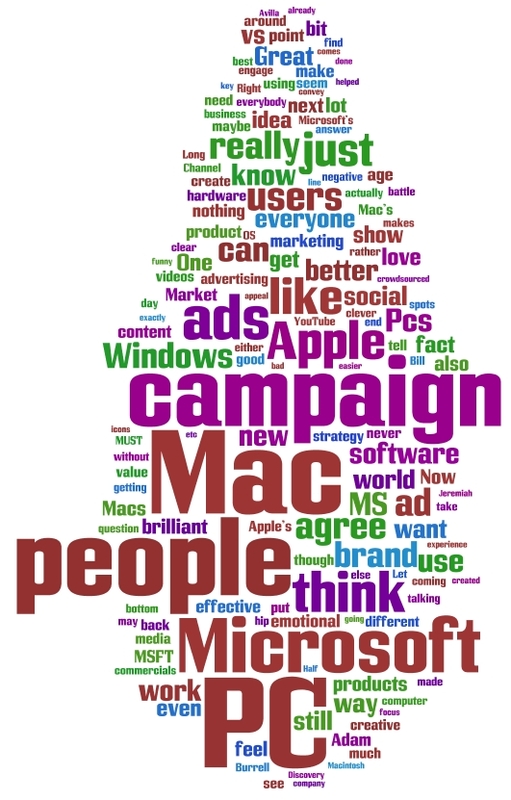 In How Microsoft Can Win The PC/Mac Campaign my friend Jeremiah Owyang asked for comments about the new Microsoft “I’m a PC” advertising campaign. I commented (I was #15). I said the new commercial was “infinitely better” than the previous two Seinfeld commercials. But I didn’t see the point. Nevertheless, the comments do provide a really interesting cross section of positive, negative, and/or thoughtful views. What does this tell us? Beats me; what do you think? Copyright © 2008 by Dennis D. McDonald, Ph.D. Dennis is an independent project management consultant based in Alexandria, Virginia who has worked throughout the U.S. and in Europe, Egypt, and China. His clients have included the U.S. Department of Veterans Affairs, the U.S. Environmental Protection Agency, the World Bank, AIG, ASHP, and the National Library of Medicine. His experience also includes database publishing and data transformation, integration of large systems, corporate technology strategy, social media and collaboration technology adoption, statistical research, and IT cost analysis. His web site is located at www.ddmcd.com and his email address is ddmcd@yahoo.com. On Twitter he is @ddmcd.